Robert "Bobby" Lee Dodd (November 11, 1908 – June 21, 1988) was an American college football coach at Georgia Institute of Technology (Georgia Tech). He was elected to the College Football Hall of Fame as a player and coach. He is one of only three people to have done this. Dodd was born in Galax, Virginia. He moved to Kingsport, Tennessee and played several sports at Dobyns-Bennett High School. After high school, he played as a quarterback at the University of Tennessee. From 1931–1945, he worked as an assistant coach for William Alexander at Georgia Tech. Alexander hired Dodd while he was still a student at Tennessee. 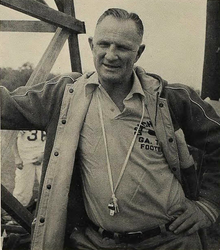 Dodd replaced Alexander in 1945 and became the third head coach at Georgia Tech. He retired from coaching after the 1966–67 season, with 165 wins, 64 losses, and 8 ties in his career. He also worked as athletic director for Georgia Tech from 1950 until 1976. Dodd died in June 1988 at the age of 79 in Atlanta, Georgia. Dodd was quarterback for the University of Tennessee football team from 1928 to 1930. He played for its coach, Robert Neyland. Dodd wanted to play for Georgia Tech but was not offered a scholarship. In the games that Dodd started at Tennessee, they had a record of 27–1–2. Dodd played a major role in one famous game. During his sophomore year, in a game against Alabama, "Dodd threw a touchdown pass in that game to tie Alabama, 13–13. Then he punted out of bounds inside the Alabama 1-yard line and Tennessee got a safety on the next play to win, 15–13." This was an important game for both teams since they were rivals. Another time in Dodd's playing career showed the thinking he would use in his coaching career. "Against Florida in 1930 he got his teammates in a huddle and told them about a play he had used in high school. When the ball was snapped, it was placed on the ground unattended. The players ran in one direction. Then the center returned, picked up the ball, and waltzed to the winning touchdown." Tennessee fans even developed a catch phrase for Dodd during his time there: "In Dodd we trust." Dodd was selected to be on Grantland Rice's All-American team in 1930. He was the second player from Tennessee to make an All American team. The first was Gene McEver in 1929. In 1959, Dodd was selected for the University of Tennessee's Hall of Fame and to the College Football Hall of Fame as a player. He was elected in the same year as teammate Herman Hickman. Dodd had a 165–64–8 record as head coach at Georgia Tech. He led Georgia Tech to two Southeastern Conference (SEC) championships (1951 and 1952) and one national championship in 1952. While he was coach, Tech played in 13 major bowl games. The school won 9 of these games, including six in a row from 1951 to 1956. His team had a 31-game winning streak from 1951 to 1953. Dodd took over the Georgia Tech football program after Coach Alexander's retirement in 1944. Dodd's coaching ideas were about developing and treating his players well. He did not believe in hard physical practices. Instead, he liked practices that were about the small details of football. Dodd's ideas led to winning. He set the record for career wins at Tech at 165 career coaching wins including a 31-game winning streak from 1951–1953. He also won two Southeastern Conference Titles and the 1952 National Title. The 1952 title was part of a 12–0 perfect season and Sugar Bowl win over Ole Miss. Dodd also understood the rivalry with the University of Georgia. His teams won 8 games in a row over the Bulldogs from 1946–1954. They had 176 points to Georgia's 39 during the winning streak. This 8–game winning streak is still the longest winning streak for either side in the series. Dodd ended his career with a 12–9 record against Georgia. Dodd's career included Georgia Tech leaving the Southeastern Conference. The initial reason for them leaving was a feud between Dodd and Alabama Crimson Tide Coach Bear Bryant. The feud began when Tech was visiting the Tide at Denny Stadium in 1961. After a Georgia Tech punt, Alabama fair-caught the ball. Chick Granning of Georgia Tech was running down to tackle the receiver of the punt, but relaxed after the signal for the fair catch. Darwin Holt of Alabama continued play and hit his elbow into Granning's face. This caused severe breaks in Granning's face, a broken nose, and blood-filled sinuses. Granning became unconscious and suffered a severe concussion. These injuries left him unable to play football ever again. Dodd sent Bryant a letter asking Bryant to suspend Holt. Dodd felt that Holt injured Granning on purpose. Bryant never suspended Holt. The lack of punishment made Dodd angry and caused him to want to leave the SEC. Another issue for Dodd was Alabama's and other SEC schools' recruiting of players. Schools would recruit more players than they could have on their roster. During the summer practice sessions, the teams would remove extra players. This would happen after the signing day which meant those players could not find somewhere else to play. Dodd asked the SEC leaders to punish the "tryout camps" of other SEC members, but the SEC did not. Finally, Dodd took Georgia Tech out of the SEC in 1963. Tech would play without a league like Notre Dame and Penn State (at the time) during the final four years of Dodd's coaching career. In 1967, Dodd passed the head coach position to his favorite assistant, Bud Carson. Dodd continued to work as athletic director which he had first been hired as in 1950. He would not retire from athletic directing until 1976. In 1983, he said he would like to run a United States Football League team if Atlanta was given one. The league, however, shut down before Atlanta received a team. Dodd wanted to win every game, but unlike some other coaches, he did not believe in risking his athletes' health in order to win. He believed that the most important part of college football was the college football player. In honor of the character of Dodd, each year a Division I college coach who has shown leadership both on and off the field is awarded the Bobby Dodd Coach of the Year Award. This award is given by the Bobby Dodd Coach of the Year Foundation. He was inducted into the College Football Hall of Fame as a player in 1959 and as a coach in 1993. In 1988, Georgia Tech named its stadium Bobby Dodd Stadium in honor of him. The Bobby Dodd Institute is a group that helps people with disabilities; it is named in honor of Dodd for his help to the disabled. Wikimedia Commons has media related to Bobby Dodd. ↑ "Bobby Dodd". New Georgia Encyclopedia. 1998. Retrieved 2012-05-27. ↑ 2.0 2.1 2.2 2.3 2.4 "Bobby Dodd biography". Bobby Dodd Coach of the Year Foundation. Archived from the original on 2008-12-01. Retrieved 2009-08-01. ↑ "Alphabetical Inductee List" (PDF). Georgia Sports Hall of Fame. Retrieved 2009-08-01. ↑ 4.0 4.1 4.2 4.3 4.4 "Bobby 'In Dodd We Trust' Dodd". College Football Hall of Fame. Retrieved 2009-08-01. ↑ 5.0 5.1 "Dodd, "Bobby" (Robert L.)". Sports Biographies. HickokSports.com. Retrieved 2009-08-01. ↑ 6.0 6.1 "Bobby Dodd, Coach at Georgia Tech, Dies of Cancer at 79". The New York Times. 22 June 1988. Retrieved 2009-09-14. ↑ "The Third Saturday in October: Tennessee's Best Wins against Alabama". bleacherreport.com. Bleacher Report. Retrieved March 22, 2010. ↑ "Bobby Dodd". University of Tennessee's Hall of Fame. Smokey's Trail. Retrieved 2009-08-01. ↑ "Bobby Dodd". University of Tennessee. Archived from the original on 2007-03-17. Retrieved 2009-08-01. ↑ 10.0 10.1 "Bobby Dodd would join USFL". The Spokesman-Review. 10 February 1983. Retrieved 2009-09-14. ↑ 11.0 11.1 11.2 11.3 11.4 "Bobby Dodd Bio". RamblinWreck.com. Georgia Tech Athletic Association. Retrieved 2007-08-10. ↑ 12.0 12.1 12.2 "Georgia Tech vs Georgia". cfdatawarehouse.com. College Football Data Warehouse. Retrieved 2007-08-10. ↑ "Bobby Dodd Coach of the Year Foundation". Bobby Dodd Coach of the Year Foundation. Retrieved 2009-08-01. ↑ "Bobby Dodd Stadium at Historic Grant Field". Georgia Tech Athletic Association. Retrieved 2009-08-01. ↑ "Bobby Dodd Institute". Bobby Dodd Institute. Retrieved 2009-08-01. This page was last changed on 8 January 2019, at 06:45.